The Legal Team of IPOB under the Leadership Of Citizen Nnamdi Kanu, have secured the release of Biafran activists, who were illicitly detained by the Nigeria Police at the 27th February 2018 EASTERN CONSULTATIVE Assembly meeting in Enugu State. 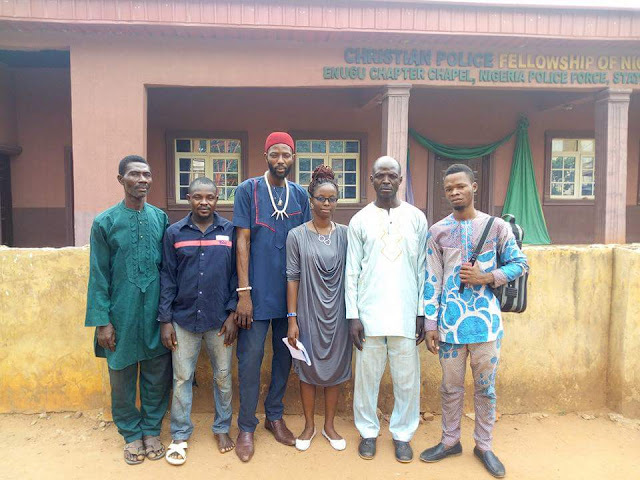 The victims were abducted by the Police Command , at Universal Hotel(The meeting venue) and various streets in Enugu State. Some of the Biafran activists were forced out of moving vehicles and inhumanely brutalised, for putting on Eastern Traditional Attire and falsely accused of disrupting the ECA meeting. The brutalised injured victims were detained in Enugu State CID and threatened to be executed, until the Legal Team Of IPOB fought and secured their release. The victims were fed by IPOB while on detention and Transportation of those not residence in Enugu, was accorded to them. The freed activists, appreciated the efforts and abutment shown to them by, Nnamdi Kanu led IPOB and reaffirmed their support for Biafra restoration. The Indigenous People Of Biafra, vowed to file a suit against the Nigeria Police, for inhumane Brutalisation and unlawfully detaining her members for more than Twenty Four Hours, without arraignment in Court or releasing them, which is against the violated Nigeria Constitution.